Russia’s military carried out a flight test of a new multi-warhead intercontinental ballistic missile on Monday amid growing tensions with the United States over the crisis in Ukraine. The SS-27 Mod 2 road-mobile ICBM was launched around 2:40 a.m. EST from Russia’s Plesetsk launch facility, located about 500 miles north of Moscow. "The main purpose of the launch is to validate the reliability of a batch of this class of missiles made at the Votkinsk Plant," Defense Ministry spokesman Igor Yegorov told state-run Interfax-AVN. 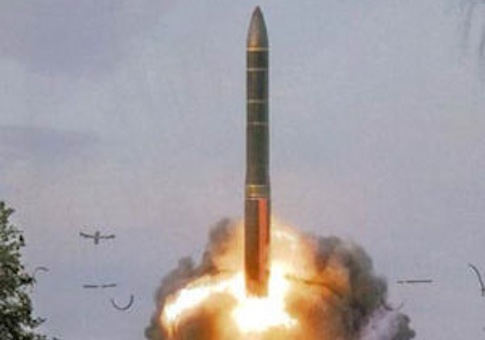 An unspecified number of simulated nuclear warheads landed at an impact range on the Kura test range on the Kamchatka Peninsula, in the Russian Far East, Yegorov said. The distance is around 3,500 miles. The SS-27 Mod 2 is Russia’s newest ICBM and has been touted by Russian officials as designed specifically to defeat U.S. missile defenses. Mark B. Schneider, a missile specialist with National Institute for Public Policy, said there is evidence indicating the Russians have violated the START arms treaty by developing the SS-27 Mod 2 with multiple warheads. "The original missile that Russia called the Topol M Variant 2 and we call the SS-27 was a single warhead missile," Schneider told the Free Beacon. "START prohibits increasing the declared number of warheads." The missile test launch followed an incident Saturday when a Russian Su-24 jet conducted a dozen low-altitude passes over a U.S. warship in the Black Sea. The Pentagon called the maneuver "provocative." "The aircraft did not respond to multiple queries and warnings from USS Donald Cook, and the event ended without incident after approximately 90 minutes," Army Col. Steven Warren said. "The Donald Cook is more than capable of defending itself against two Su-24s," the colonel said. Warren said the aircraft appeared to be authorized to make the low passes. "We've seen the Russians conduct themselves unprofessionally and in violation of international norms in Ukraine for several months, and these continued acts of provocation and unprofessionalism do nothing to de-escalate the situation in Ukraine, which we called on the Russians to do," he said. The warship has been in the Black Sea in a show-of-strength deployment. It is currently making a port visit to Constanta, Romania. The Russian ICBM, which Moscow calls the RS-24 Yars missile, will replace older Topol mobile ICBMs. The United States currently has no comparable road-mobile ICBM. The mobility makes the missiles very difficult to detect and target. The last flight test of the SS-27 Mod 2 was in December. Russia currently has an estimated 80,000 troops deployed along with armored vehicles close to Ukraine’s eastern border. A senior Obama administration official said last week that pro-Russian unrest, including the takeover of police stations in two eastern Ukrainian towns, appears to be the work of Russian agents seeking to foment unrest—something that could be used a pretext for a Russian military invasion. In Moscow, Russian Foreign Minister Sergei Lavrov said Russia has asked the United States to explain the recent visit to Kiev by CIA Director John Brennan. "We want to understand what our western colleagues are doing in reality, particularly we want to understand what do the reports about an urgent visit of the director of the Central Intelligence Agency of the USA, Mr. Brennan, to Kiev means," Lavrov said, according to state-owned Moscow Rossiya 24 TV. "No clear explanations have yet been given to us." A Russian presidential spokesman said President Vladimir Putin has received requests for Russia to intervene in Ukraine, following reports of domestic unrest. "The Russian president is watching the development in these regions with great concern," Dmitri Peskov, the spokesman, told reporters. "Many appeals—addressed personally to Putin, asking to help in this or that way and asking to interfere in this or that way have been received," Peskov said, according to Interfax. The Obama administration is considering a Russian request to upgrade electronic intelligence gathering sensors used on aircraft that would overfly the United States as part of the Open Skies Treaty, according to the Weekly Standard. The debate on granting the Russian request prompted a letter from House Permanent Select Committee on Intelligence Chairman Rep. Mike Rogers (R., Mich.) opposing the move. "Given current world events, President Putin appears to be more than willing to disregard international norms of behavior in seeking geopolitical advantage. We should not now naively believe he will unilaterally adhere to the limitations of the Open Skies Treaty," Rogers stated in a letter to President Obama sent Friday. Senate Intelligence Committee members also are questioning whether the administration should permit the upgraded Russian spy flights. A spokeswoman for the U.S. Northern Command/North American Aerospace Defense Command, which monitors foreign missile launches, had no immediate comment.